Hello! Pacman is an unusual action/adventure game by Namco. Unlike other games from the popular franchise, Hello ! 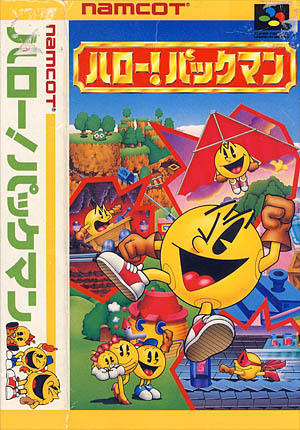 Pacman is in fact based on the animated series aired in the 1990s and most of the colorful places visited throughout the game are directly borrowed from it. The Pac Man family, including the cute Pac-Man baby, are quietly resting at home and enjoying their everyday life and Pac Man sets out to fulfill various tasks for them. Interestingly, the player doesn't directly control Pac Man but influences his decision-making and watches out for him. A slingshot can be used to hit anything on the screen (including Pac Man himself) and to call for his attention. Another action gets the player to shout at our yellow hero and ask him to look at something, or in a particular direction. This is especially useful if Pac Man decides to aimlessly wander around the screen or when he starts walking in the wrong direction. Pac Man's mood is also important and should be taken care of. Finally, and not the least, a limited amount of power-pellets can be thrown at him - they turn him into a fearless and ghost-gobbler Super Pac-Man. But these super-pellets should only be used in case of an emergency and especially when the trademark ghosts decide to attack. 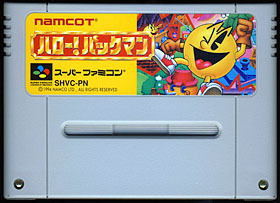 The game features four different quests, tons of mini-games, side quests (such as game cartridges that unlock the original Ms PacMan game) and other unique treats. Hello! Pacman reminds me of Wonder Project-J in many ways. Pac Man definitively shares, at least in this game, a lot in common with Pino - they both have this sort of what we could call... child-like "funny dumbness". Pac Man has special ways of dealing with things - whereas Pino would just naively react to any situation (by usually eating objects handed to him), Pac Man simply gets scared and often in funny ways. The game is packed with tons of short animations and detailed scenes, and their sole purpose is to entertain the player and they don't seem related to the quest in any ways. But all of this comes at a price and the game is relatively short. Hello! Pacman was actually released outside of Japan and I'm still amazed about that move, I only wish Wonder Project J had followed the same route... Anyway, all in all, Hello! Pacman is a wonderful game, incredibly addictive and way too fun and clever to miss.